Minimalists are those netizens who prefer websites that mostly contain rich and relevant textual content (with maybe bits of images sprinkled here and here), but certainly not auto-playing videos, flashy animations, animated gifs and motion ads. Making an excruciatingly heavy and painful website by combining all these things not only take a toll on the server’s back end resources, but is also a step back in the advancement of the Internet, not forward, at least in my humble opinion. Its quite evident that we are the minority because all popularity metrics point towards non-minimalist social sites like Facebook, Twitter, Google Plus, etc. And to add to that agony, Reddit has also decided to follow along the path of those other sites as we are being shunned to the old Reddit. Old Reddit is not just being shunned as legacy, but also in the process of being dismantled. That’s because any new visitor who visits a subreddit will always be shown the new interface by default (even if the subreddit owners/mods happened to have created it on old Reddit). Besides, the user is also being gently prodded on to embrace the new version by various measures. For example, the default profile page of the user is the new profile page (even when visiting old.reddit.com, yeah!) and the only way to switch back to the older version is a small hidden switch in the preferences section that you wouldn’t know exists unless you go there and scroll to the absolute bottom of the page! On a similar tone, when you logout from Reddit in order to log back in (using a different alt which is quite common on Reddit), you’ll suddenly find that you are back in the new version and the header link and everything else points to the www.reddit.com, and not old.reddit.com! You’ll be surprised to find that even if you switched your profile back to the legacy mode, other Redditors who visit your profile will still see the new version there. In other words, Reddit is trying to send us a clear message: Fall in line with our new system or just get lost. And get lost we will, but the question is where? Certainly not Facebook, Twitter or Google Plus because that’s not what a minimalist will want to use, even though they may have an account on one of these other sites just for being compatible with their non-minimalist friends, relatives, etc. In this article, I’m going to describe a few such social networking sites which are relatively minimalist, though all of them may not have the same charm as the good old Reddit. Firstly, lots of minimalist sites are either getting closed or turning into micro-niches that nobody except a certain section want to use. For instance, News Vine shut down recently, it was a collaborative journalistic platform where users contributed all kinds of stories. I also used to like Voat very much, but recently there have been reports that Voat is turning into a meeting place for right wing supremacists and those who like to troll online users based on their caste/ehtnicity. On a similar note, StumbleUpon was also recently shut down and transformed into something called Mix, I don’t quite like the looks of the new design. Though Hacker News is a niche site for the technology nice, it sill tops my list because it is almost as minimal as you could get. Its a purely textual content site with neither images nor CSS transitions and perhaps that’s how most of the technologists like it. The content quality on this site is also highly vetted and top notch, and definitely better than many popular subreddits where politics comes into the mix every now and then as the mods try to sneak in their own propagandas in the subreddit content. There are two reasons to include Slashdot in the list. Firstly, its a minimalist site, and secondly, it is owned by BizX LLC, the same company who acquired SourceForge after the huge fiasco in Jan, 2016. If most media reports are to be believed, the new owners are doing a great job of rebuilding SourceForge from its old tarnished image. The site design is also much better than the heavy ones like Google Plus, Facebook and Quora, Slashdot is also very light on loading server resources (HTML/CSS/JS) which I like a lot. Sites like Slashdot who strive to improve the user experience and UI efficiency like this deserve all the users in the world, yet its a funny world where these other heavy sites get all the attention! So, whom I should blame if not the users who visits these sites? Hubski was something that was designed from the ground up to be a Reddit Alternative, so it won’t disappoint you if you are looking for an alternative to Reddit. Hubski was started by Mark Katakowski as a clone of Hacker News, and the code is still in a Lisp dialect. 4chan is also a minimalist site like Reddit, but geared more towards Internet activism groups like Anonymous. A redditor should feel comfortable with their discussion thread UI which reminds you a bit of the old PHP bulletin boards. Snapzu is just like Reddit, only it has a more polished interface and they call their category pages “tribes” instead of subreddits, for instance /t/technology is the technology tribe. However, you need to request an invite before joining, but apparently they dish them out pretty quickly! Mastodon is yet another great site, not as minimal as reddit or slashdot, but much better than facebook and twitter. And the best thing is that its federated, so mastodon.social isn’t the only instance, there are a bunch of others too and they are all synced and federated in real time, whatever instance you be on! 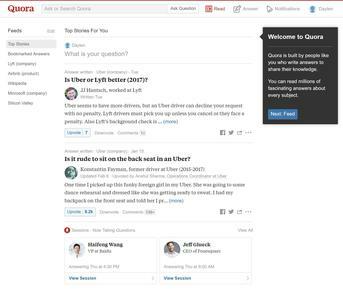 Well, Quora isn’t exactly minimal and I wasn’t even going to include it in this list, but since we have so few (working) options left, Quora needs a place here at least temporarily. At least, its way too minimal than the likes of Facebook and Twitter! After I included Quora, I thought why not Medium. To be honest, sites like Quora and Medium fall on the grey end of a minimalist sites list and we are stuck with them only because of lack of options. Nevertheless, the content quality on Medium is quite good. Today, I came across one more strong contestant in the race for Reddit alternatives, its called Raddle.me. It was built during September last year by some “radical leftists” who felt that Reddit had wrongly banned them. Raddle.me does have a leftist bias, just as Voat has a rightist bias, but the interface and looks are pretty much what a minimalist Redditor will appreciate. Also, the site is built using PHP (Symfony and Doctrine), unlike Reddit which is built using Python (Pylons framework). https://notabug.io is a decentralized Reddit alternative I am building based on reddit’s Open Source UI.